212cc BSP Engine Kit includes the following: BSP 212cc engine with JT Cylinder head, Max Stroke Crankshaft "2.163-2.173", 10.8# valve springs, NEW BSP-4 Race Cam or choose your cam in the options, Performance T6 treated 5 over cast rod, Big Bertha Black Out aluminum chain guard, BSP Black Out aluminum top plate, BSP Black Out aluminum filter adapter, BSP filter & cover sock, Walbro fuel pump, (Billet Aluminum Flywheel or optional speedway flywheel), BSP Race ready blue printed Carburetor CNC'd to (.615), double reinforced blower housing tabs. All gaskets to complete engine are included. Also includes Black valve cover with pulse fitting installed,fuel line and throttle kit consisting of cable, cover, clevis pin, and Fuel Filter. This motor is also our Sealed Engine option for tracks or classes that want the option of a sealed motor for competition. You would need to select the race ready option to have everything in the motor race ready option set and the motor sealed for free. 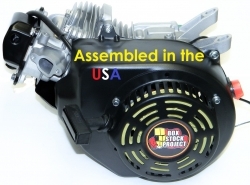 Include in the notes section you want the motor sealed or it will be sent to you unsealed. For more info or if you have a specific engine application in mind that we do not have listed, give us a call and we can make it happen. 386-938-4211.